Drugs as Weapons Against Us meticulously details how a group of opium-trafficking families came to form an American oligarchy and eventually achieved global dominance. This oligarchy helped fund the Nazi regime and then saved thousands of Nazis to work with the Central Intelligence Agency. CIA operations such as MK-Ultra pushed LSD and other drugs on leftist leaders and left-leaning populations at home and abroad. Evidence supports that this oligarchy further led the United States into its longest-running wars in the ideal areas for opium crops, while also massively funding wars in areas of coca plant abundance for cocaine production under the guise of a “war on drugs” that is actually the use of drugs as a war on us. 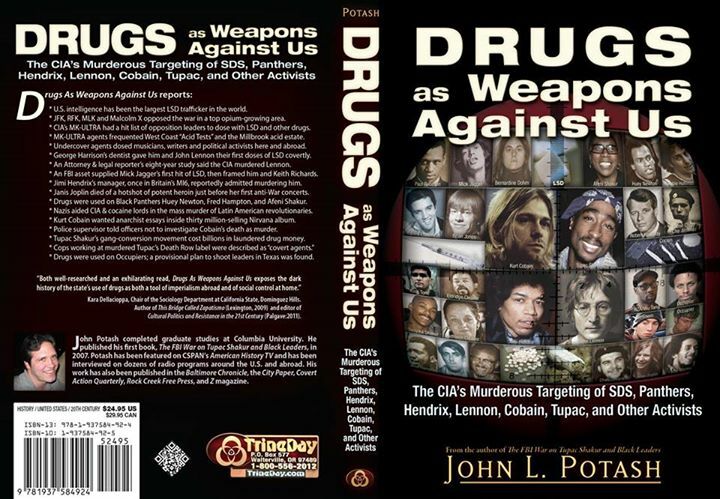 Drugs as Weapons Against Us tells how scores of undercover U.S. Intelligence agents used drugs in the targeting of leftist leaders from SDS to the Black Panthers, Young Lords, Latin Kings, and the Occupy Movement. It also tells how they particularly targeted leftist musicians, including John Lennon, Jimi Hendrix, Kurt Cobain, and Tupac Shakur to promote drugs while later murdering them when they started sobering up and taking on more leftist activism. The book further uncovers the evidence that Intelligence agents dosed Paul Robeson with LSD, gave Mick Jagger his first hit of acid, hooked Janis Joplin on amphetamines, as well as manipulating Elvis Presley, Eminem, the Wu Tang Clan, and others.